Summary: It is a beautiful spring day when City Dog first visits the country. By the time the reader sees him in the opening full-page painting, he has already raced across a wide field and nearly off the page, “and all without a leash!” His initial encounter is with something he has never seen before, sitting green and expectant on a rock. It is Country Frog. The two become fast friends, and Country Frog teaches City Dog all sorts of country games. When City Dog returns in the Summer, he runs straight to Country Frog’s rock, and they play city games together. By fall, friendship has grown tender and sweet, but Country Frog is weary, and he suggests playing “remember-ing games” this time. Then comes winter, and when City Dog races to Country Frog’s rock, his friend is not there. A bewildered City Dog sits all alone as the purple shadows deepen, waiting for his friend. A full year of seasons has gone by, and it seems as if all is lost, but Spring comes again. City Dog still longs for his old friend, but a new friendship blooms when City Dog smiles a distinctly froggy smile and agrees to play with a new pal, Country Chipmunk. Literary elements at work in the story: The plot of City Dog, Country Frog could not be simpler: dog meets frog, dog and frog become friends, dog loses frog (we are never actually told why frog is gone, but it is possible that an amphibian’s lifespan is short), dog grieves, dog meets chipmunk. The real heart of this story in five short chapters is the absolute joy of friendship and the mournfulness of loss that illustrator Muth conveys in his luminous watercolors. Dog’s tail never stops wagging when he is with frog. His tongue lolls when they play, and his eyes close to blissful slits as he floats in the river with frog on his head. When frog is gone, the reader can see that City Dog is baffled and utterly lonely by the set of his ears and the now-stilled tail. This is a book of much richness, despite its few words. 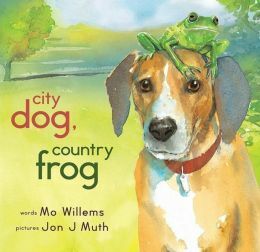 How can you tell by looking at City Dog and Country Frog that they wanted to be friends? How can you show other people that you want to be friends? What do friends look like? This story takes place over the course of a whole year and a little bit more. What were some of the happy times? What were some of the sad times? Have you ever had sad times in your life? Who helped you when you felt sad? City Dog, Country Frog by Storypath is licensed under a Creative Commons Attribution-NonCommercial 4.0 International License.